FRANKFURT - PSA Group told German Chancellor Angela Merkel and labor representatives that it would uphold Opel and Vauxhall job guarantees if it buys the European arm of General Motors, though some analysts say thousands of job losses are likely eventually. As part of a charm offensive of the political and automotive establishment in Germany, PSA CEO Carlos Tavares discussed his plans with Merkel on Tuesday, after seeking to reassure powerful German labor union IG Metall and Opel's European works council on Monday about the impact of any deal on existing sites. "PSA Group reaffirmed its commitment to respect the existing agreements in the European countries and to continue the dialogue with all parties," PSA said in a statement on Tuesday. Tavares's discussion with Merkel, in a phone call, was "fruitful," PSA said. Tavares presented the rationale for creating a European champion with five "complementary" brands with deep roots in their respective domestic markets and told Merkel that Opel would benefit from considerable independence within the group. "The tone of the exchange was very convivial and Chancellor Merkel was very receptive to our arguments," PSA said. According to a German government spokesman, he also said that PSA would give plant, investment and job guarantees. The labor ministers of France and Germany said that they believed a deal between GM and PSA would be a "win-win situation" for both countries. "We believe that both locations could benefit from it - both the French and the German plants. German-French cooperation could really spawn a champion company and that's why we're very pleased about the development today," German Labor Minister Andrea Nahles said, speaking at a BMW motorcycle plant in Berlin with her French counterpart Myriam El Khomri. PSA has agreed to adhere to existing pledges by GM not to impose forced lay offs on some of its German workforce until the end of 2018. Some existing agreements about building certain models at Opel stretch beyond 2020. However, some analysts say PSA will eventually need to make big cuts to turn around money-losing Opel and sister brand Vauxhall in a European car industry that has struggled for years with overcapacity. "It's about hard restructuring in Germany, the UK and in Spain, resulting in at least 5,000 manufacturing job cuts. In the end, an integrated General Motors Europe will likely have 20 to 30 percent fewer workers," Evercore analysts said in a note. Germany accounts for about half of Opel's 38,000 staff, while 4,500 are in Britain where Opel operates as Vauxhall. Two sources close to PSA told Reuters last week that job and plant cuts were part of the tie-up talks, with the two Vauxhall sites in Britain in the front line. 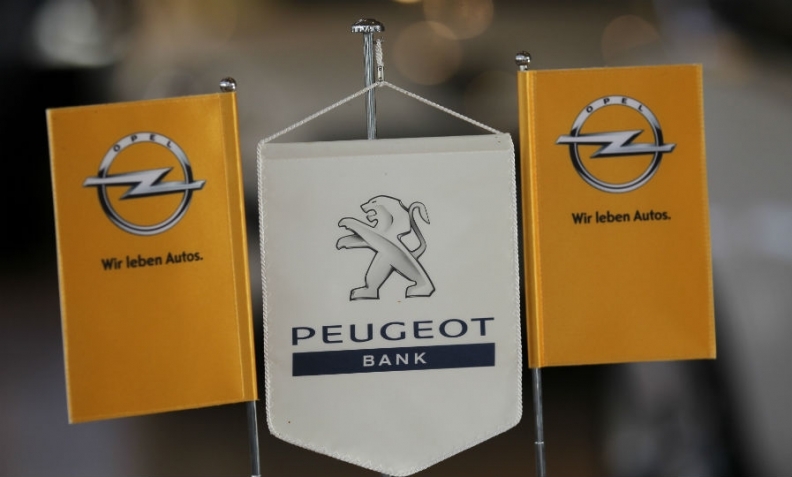 Paris-based PSA said in a statement it planned to work closely with Opel labor representatives to "find a path to the creation of a European champion with Franco-German roots". Opel CEO Karl-Thomas Neumann said on Twitter he believed that PSA's comments would reassure the carmaker's employees. "Good that PSA has now reaffirmed its pledge to respect existing agreements." PSA's Tavares has also underlined his desire to build on Opel's identity in conversations with German labour representatives. "Tavares communicated convincingly in the talks that he is interested in a sustainable development for Opel/Vauxhall as an independent company," European works council chief Wolfgang Schaefer-Klug said in a separate statement. Britain's Unite union has yet to receive assurances from PSA officials regarding the possible takeover of Vauxhall.